Tomorrow morning Zoho will announce new import functionality for migrating Google Notebooks into Zoho Notebook. This comes on the heels of Google’s decision to stop Google Notebook development and quit adding new accounts. Also updated is a the Firefox Extension for Zoho Notebook. 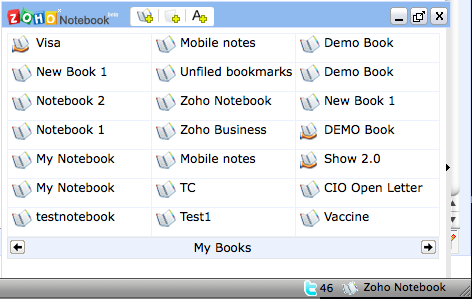 Much like Delicious, the Zoho extension provides Notebook access via a pop-up menu. Handy functionality includes web page screenshots-both entire page and specific selections, quick text add, and a synchronized copy of your notebook. Migrating is simple because Zoho allows sign-on using your Google account. Just sign into Zoho with your Google ID, install the new Firefox extension, and type a command when you visit your Google Notebook account. More details Zoho’s blog.